Smithsonian’s Future Con was born out of a partnership with Awesome Con, Washington DC’s version of the popular, multi-genre entertainment convention Comic Con. What Future Con achieves is a balance between science and sci-fi, integrating the two to investigate what is possible in science, technology, engineering and space exploration. The convention brings together some of the brightest minds in bleeding-edge technology to discuss whether sci-fi phenomena, such as faster-than-light travel, artificial intelligence and cyborgs, is fantasy or feasible. 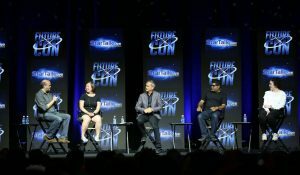 An estimated 60,000 people attended the more than 30 Future Con sessions with presenters from NASA, the National Science Foundation, universities, the Science Channel, museums and industry researchers. UW electrical engineering (UW EE) Ph.D. student Katherine Pratt joined the StarTalk Live! panel, entitled “Engineering the Future: What Humanity Can, Should, and Will need to Do.” The panel, which is a spinoff of Neil deGrasse Tyson’s popular radio show StarTalk, was hosted by International Space Station commander Colonel Chris Hadfield. The speakers were probed on space exploration – on what is needed to expand our boundaries off-planet. As a neurosecurity researcher in the university’s BioRobotic’s Lab, Pratt discussed the potential advantage of a remote-operated surgical robot the lab developed in offering indirect human contact in space. For dangerous situations, the robot could be deployed, reducing human risk. Pratt also delved into augmentation of human abilities through technology. She discussed her project on brain stimulation that allows subjects to “feel” sensation from a prosthetic limb, for example. Pratt is a part of a skilled network of UW EE researchers and researchers at the Center for Sensorimotor Neural Engineering (CSNE), who are investigating brain-computer interfaces (BCIs) to bridge the gap between nature and technology, particularly in those suffering from spinal cord injury. Although the iconic blue phone box swooping through space in Dr. Who is more fantasy than feasible, entertainment exposes science to new generations of thinkers. For researchers like Pratt, it’s sometimes the wildest ideas that inspire possibility.